How Do You Care For Your Chopard Watch? Find Out Here. How Should I Clean my Chopard Watch? Jewelry models with mobile elements within the case (e.g. diamonds, fish, etc.) between one or two sapphire crystals are not guaranteed water-resistant. This means it is recommended to avoid any contact with alcohol-based products (perfumes, creams, etc.) as well as immersion in water. 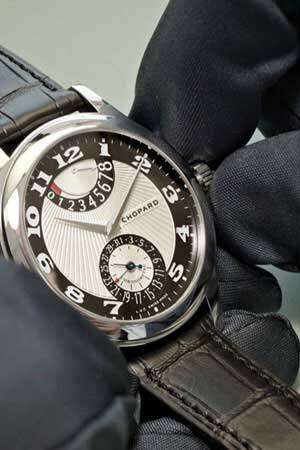 Chopard watches are equipped with security gaskets that guarantee their water-resistance. Over time, these gaskets may deteriorate and the case may be less resistant to water. We kindly recommend having the water-resistance of a Chopard watch tested by an official service center once every year, before engaging in any prolonged aquatic activity or after a violent shock. My Chopard Watch has Condensation Inside, What Should I Do? When the temperature changes abruptly, slight condensation may form under the watch glass. Generally, it disappears of its own accord without affecting the smooth running of the watch. However, if the misting persists, it is important to consult an official Chopard retailer or an official Chopard service center. My Chopard Watch has a Leather Strap, Is there special care for the leather? How often should I preform Service Maintenance On my Chopard Watch? My Chopard has a Quartz Movement and Stopped Working, What should I do? More than likely, this is a battery issue. 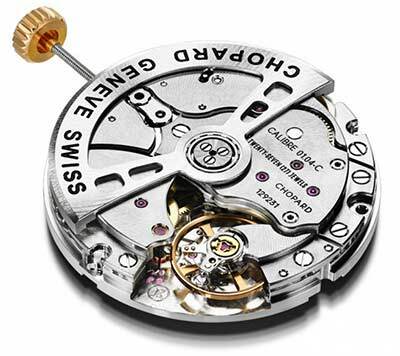 In order to guarantee the performance of a quartz watch, movement testing and battery replacement must be entrusted to an official Chopard service center, which will ensure it respects the brandss specific criteria. We strongly advise against leaving a worn-out battery in a watch, since it might damage the movement. Is my Chopard Watch Water-resistant? The water-resistance of a watch is generally given in meters (m) or bar (1 bar = 10 meters). A watch bearing the mention "Water-resistant", with or without a pressure indication, must comply with and have successfully undergone the tests foreseen by the NIHS 92-20 norm (equivalent to the ISO-22810 international norm). They may be used in conditions involving variations in water or air pressure or temperature. However, regardless of whether or not there is an additional mention of the pressure, they are not intended for scuba diving. So-called diver's watches are wristwatches that must be able to withstand diving at depths of at least 100 metres (330 ft), be equipped with a dive-time control system and meet all the criteria stipulated by NIHS 92-11 norm (ISO 6425): luminosity, shock-resistance, resistance to magnetic fields and sturdy wristband. My Chopard Watch has a self-winding movement and I haven't worn it in a while. Does it need to be adjusted before wearing? My Chopard Watch has a hand-wound movement. What is the proper way to wind it? Are there any special toold required to wind my Chopard L.U.C. Tourbillion Watch?